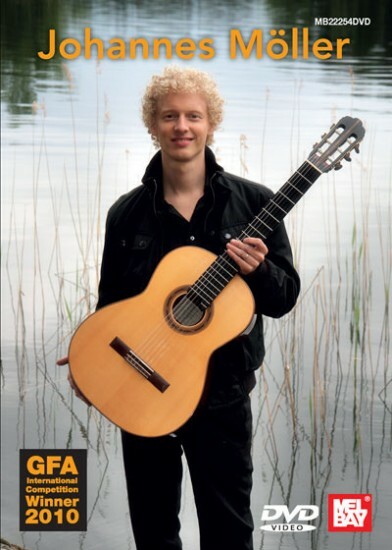 Explore the musical world of guitarist and composer Johannes Moller, winner of the 2010 Guitar Foundation of America International Concert Artist Competition. Included on the program are two of his favorite pieces from the standard repertoire: Agustin Barrios Un Sueno en la Floresta and his own transcription of Asturias (Leyenda) by Isaac Aleniz. Johannes also invites us into his own sound world with a selection of original compositions. Among them are three earlier unrecorded pieces: "listening to the silence of a starry night", Echo of the Trees (for charango and guitar) and Future Hope a piece dedicated to an organization which has changed the lives of hundreds of street children in Kolkata, India. Excellent camera work, sound & Playing! One of the Best DVDs!